Radical Sikh group Shiromani Akali Dal (Amritsar) on Friday honoured 55-year-old Jarnail Singh, who had slapped Punjab Panchayat minister Sikandar Singh Maluka on November 20 in Hamirgarh village in Bhatinda. Jarnail was unhappy with the way the Punjab government had handled the sacrilege cases. The minister faced major embarrassment as he arrived in Hamirgarh, seeking support from locals for the Akali Dal rally. The minister’s turban fell off when Jarnail Singh allegedly slapped him. The middle-aged villager was overpowered and severely beaten up by the supporters of the minister before he was handed over to the police. Jarnail Singh is a true Sikh who was mercilessly beaten up for showing the courage to question the minister. 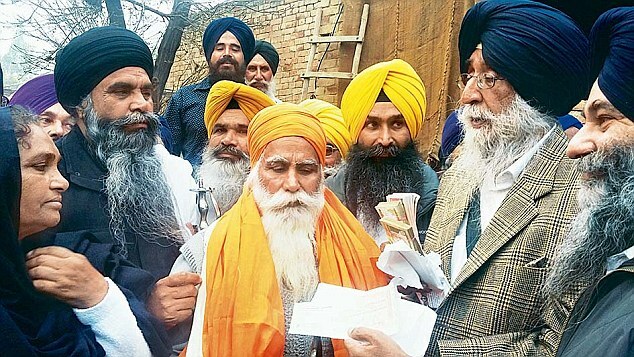 We honoured him at his residence and presented him with a cash reward of Rs 2.20 lakh,” Simranjit Singh Mann, president of Shiromani Akali Dal (Amritsar), said. The CBI has registered a case and is probing the three sacrilege incidents reported in Punjab. The cases were handed over to CBI after the Punjab government failed to solve the mystery.